A reissue will not be granted to "recapture" claimed subject matter which was surrendered in an application to obtain the original patent. Greenliant Systems, Inc. v. Xicor LLC, 692 F.3d 1261, 103 USPQ2d 1951 (Fed. Cir. 2012); In re Mostafazadeh, 643 F.3d 1353, 98 USPQ2d 1639 (Fed. Cir. 2011); North American Container, Inc. v. Plastipak Packaging, Inc., 415 F.3d 1335, 75 USPQ2d 1545 (Fed. Cir. 2005); Pannu v. Storz Instruments Inc., 258 F.3d 1366, 59 USPQ2d 1597 (Fed. Cir. 2001); Hester Industries, Inc. v. Stein, Inc., 142 F.3d 1472, 46 USPQ2d 1641 (Fed. Cir. 1998); In re Clement, 131 F.3d 1464, 45 USPQ2d 1161 (Fed. Cir. 1997); Ball Corp. v. United States, 729 F.2d 1429, 1436, 221 USPQ 289, 295 (Fed. Cir. 1984); In re Wadlinger, 496 F.2d 1200, 181 USPQ 826 (CCPA 1974); In re Richman, 409 F.2d 269, 276, 161 USPQ 359, 363-364 (CCPA 1969); In re Willingham, 282 F.2d 353, 127 USPQ 211 (CCPA 1960). The question as to whether a reissued patent violates the rule against recapture of subject matter surrendered during original prosecution is a question of law. Mostafazadeh, 643 F.3d at 1358, 98 USPQ2d at 1642. Claims to separate inventions/embodiments/species that were not claimed in the original application prosecution (i.e., "overlooked aspects") are not a part of a recapture analysis. For this reason, none of the examples below involve amending claims to add overlooked aspects. See MPEP § 1412.01, subsection II, for more information on overlooked aspects. Broadening Claim - A reissue claim is "broadened" where at least one limitation of the patent claims is either completely eliminated or is only presented in a broader way in the reissue claim relative to the broadest patented claim(s); see MPEP § 1412.03 for guidance as to the nature of a "broadening claim." Canceled Claim – A claim canceled from the original application to obtain the patent for which reissue is being sought. In the context of recapture case law, claims are considered canceled if the claims were deleted and not replaced or were replaced (either through cancellation or amendment) by other claims that are more specific than the canceled claims in at least one aspect in order to define the invention over the art of record in the prosecution of the original application. In other words, claims replacing canceled claims can be new claims that are narrower than the canceled claims or amended claims that are narrower than the canceled version of the claims. Original Application - The "original application" includes the prosecution record of the application that issued as the patent for which the reissue application was filed. In addition, the "original application" includes the patent family’s entire prosecution history. MBO Laboratories, Inc. v. Becton, Dickinson & Co., 602 F.3d 1306, 1316-17, 94 USPQ2d 1598 (Fed. Cir. 2010). For example, surrender may occur because of the prosecution history of related applications. Original Claim – A claim that was presented in the original application prior to surrender. See In re Youman, 679 F.3d 1335,1346 n.4, 102 USPQ2d 1862,1870 n.4 (Fed. Cir. 2012). Other or Unrelated Aspects/Limitations – Limitations that are not related to surrendered subject matter or surrender generating limitations. Overlooked Aspects - Claims to separate inventions/embodiments/species that were never presented in the original application. See MPEP § 1412.01, subsection II, for more information on overlooked aspects. Patent Claim – A claim in the patent for which reissue is being sought. Some court decisions use the phrase "original patent claim" for patent claim. Patent claims are the claims in effect as of the date of filing of the reissue application. See 37 CFR 1.173(g). Recapture – A doctrine based upon the error requirement in 35 U.S.C. 251 that prevents a reissue applicant from claiming subject matter surrendered during the prosecution of the original application. Surrender Generating Limitation (SGL) or Surrendered Subject Matter – SGL is a "limitation" presented, argued, or stated to make the claims patentable over the art (in the original application) and "generates" the surrender of claimed subject matter. A SGL or surrendered subject matter can be created by presentation of new/amended claims to define the invention over the art or an argument/statement by applicant that a limitation of the claim(s) (including a limitation in an original claim) defines the invention over the art. A patent owner (reissue applicant) is bound by the argument that applicant relied upon to overcome an art rejection in the original application for the patent to be reissued, regardless of whether the Office adopted the argument in allowing the claims. Greenliant Systems, Inc. v. Xicor LLC, 692 F.3d 1261, 1271, 103 USPQ2d 1951, 1958 (Fed. Cir. 2012). (3) finally, we determine whether the reissue claims were materially narrowed in other respects, so that the claims may not have been enlarged, and hence avoid the recapture rule. In North American Container, the court cited Pannu, 258 F.3d at 1371, 59 USPQ2d at 1600; Hester, 142 F.3d at 1482-83, 46 USPQ2d at 1649-50; and Clement, 131 F.3d at 1468, 45 USPQ2d at 1164-65 as cases that lead to, and explain the language in, the North American Container recapture test. A. The First Step - Is There Broadening? In every reissue application, the examiner must first review each claim for the presence of broadening, as compared with the scope of the claims of the patent to be reissued. A reissue claim is broadened where some limitation of the patent claims is no longer required in the reissue claim; see MPEP § 1412.03 for guidance as to the nature of a "broadening claim." If the reissue claim is not broadened in any respect as compared to the patent claims, the analysis ends; there is no recapture. B. The Second Step - Does Any Broadening Aspect of the Reissued Claim Relate to Surrendered Subject Matter? Where a claim in a reissue application is broadened in some respect as compared to the patent claims, the examiner must next determine whether the broadening aspect(s) of that reissue claim relate(s) to subject matter that applicant previously surrendered during the prosecution of the original application (which became the patent to be reissued). The "original application" includes the patent family’s entire prosecution history. MBO Laboratories, Inc. v. Becton, Dickinson & Co., 602 F.3d 1306, 94 USPQ2d 1598 (Fed. Cir. 2010). Each limitation of the patent claims, which is omitted or broadened in the reissue claim, must be reviewed for this determination. This involves two sub-steps. (A) One must first determine whether applicant surrendered any subject matter in the prosecution of the original application that became the patent to be reissued. If an original patent claim limitation now being omitted or broadened in the present reissue application was originally relied upon by applicant in the original application to make the claims allowable over the art, the omitted limitation relates to subject matter previously surrendered by applicant. The reliance by applicant to define the original patent claims over the art can be by presentation of new/amended claims to define over the art, or an argument/statement by applicant that a limitation of the claim(s) defines over the art. To determine whether such reliance occurred, the examiner must review the prosecution history of the original application (of the patent to be reissued and any related application(s)) for surrender of claimed subject matter which may result in recapture. The prosecution history includes the rejections and applicant’s arguments made therein. With respect to whether applicant surrendered any subject matter, it is to be noted that a patent owner (reissue applicant) is bound by the argument that applicant relied upon to overcome an art rejection in the original application for the patent to be reissued, regardless of whether the Office adopted the argument in allowing the claims. Greenliant Systems, Inc. v. Xicor LLC, 692 F.3d 1261, 1271, 103 USPQ2d 1951, 1958 (Fed. Cir. 2012). As pointed out by the court, "[i]t does not matter whether the examiner or the Board adopted a certain argument for allowance; the sole question is whether the argument was made." Id. If applicant did not surrender any subject matter in the prosecution of the original application, the analysis ends and there is no recapture. (B) If applicant did surrender subject matter in the original application prosecution, the examiner must then determine whether any of the broadening of the reissue claims is in the area of the surrendered subject matter. The examiner must analyze all of the broadening aspects of the reissue claims to determine if any of the omitted/broadened limitation(s) are directed to limitations relied upon by applicant in the original application to make the claims allowable over the art. [T]he recapture rule is violated when a limitation added during prosecution is eliminated entirely, even if other narrowing limitations are added to the claim. If the added limitation is modified but not eliminated, the claims must be materially narrowed relative to the surrendered subject matter such that the surrendered subject matter is not entirely or substantially recaptured. Id. at 1361. The situation in Mostafazadeh involved substantial recapture of the surrendered subject matter, which was determined under the third step of the recapture analysis. See subsection II.C. below for more explanation. The focus in the analysis of the second step must be on the subject matter that was surrendered during the original application prosecution in the context of the then-existing claims (i.e., the original claims). When an examiner determines that the broadening aspect(s) of that reissue claim relate(s) to subject matter that applicant previously surrendered during the prosecution of the original application (which became the patent to be reissued) in step 2 of the recapture analysis, the overlooked aspects inquiry may be applicable. See MPEP § 1412.01, subsection II. In Hester, supra, the Federal Circuit held that the surrender that forms the basis for impermissible recapture "can occur through arguments alone." 142 F.3d at 1482, 46 USPQ2d at 1649. For example, limitation A of the patent claims is omitted in the reissue claims and no other amendments are made. This omission provides a broadening aspect in the reissue claims, as compared to the claims of the patent. If the omitted limitation A was argued in the original application to make the application claims allowable over the art in the application, then the omitted limitation relates to subject matter previously surrendered in the original application, and recapture will exist. Accordingly, where claims are broadened in a reissue application, the examiner should review the prosecution history of the original patent file for recapture, even where the claims were never amended during the prosecution of the application which resulted in the patent. Note: The argument that the claim limitation defined over the rejection must have been specific as to the limitation relied upon, rather than a general statement regarding the claims as a whole. A general "boiler plate" sentence in the original application will not, by itself, be sufficient to establish surrender and recapture. In closing, it is argued that the limitations of claims 1-7 distinguish the claims from the teachings of the prior art, and claims 1-7 are thus patentable. Claims 1-5 set forth a power-train apparatus which comprises the combination of A+B+C+D+E. The prior art of record does not disclose or otherwise teach, providing a material-transfer apparatus as defined by the limitations of claim 1, including an A member and a B member, both connected to a C member, with all three being aligned with the D and E members. This statement is simply a restatement of the entirety of claim 1 as allowed. No measure of surrender could be gleaned from such "boiler-plate" applicant arguments. In both of the above examples, the argument does not provide an indication of what specific limitations, e.g., specific element or step of the claims, cooperative effect, or other aspect of the claims, are being relied upon for patentability. Thus, applicant has not surrendered anything by the argument. The original application claims recite limitations A+B+C, and the Office action rejection combines two references to show A+B+C. In the amendment replying to the Office action, applicant adds limitation D to A+B+C in the claims, but makes no argument as to that addition. The examiner then allows the claims. Even though there is no argument as to the addition of limitation D, it must be presumed that the D limitation was added to obviate the rejection. The subsequent deletion of (omission of) limitation D in the reissue claims would be presumed to be a broadening in an aspect of the reissue claims related to surrendered subject matter. Accordingly, the reissue claims would be barred by the recapture doctrine (absent the addition of a materially narrowing limitation related to the surrendered subject matter). The above result would be the same whether the addition of limitation D in the original application was by way of applicant’s amendment or by way of an examiner’s amendment with authorization by applicant. (C) Example (3) - Who can make the surrendering argument? Assume that the limitation A omitted in the reissue claims was present in the claims of the original application. The examiner’s reasons for allowance in the original application stated that it was that limitation A which distinguished over a potential combination of references X and Y. Applicant did not present on the record a counter statement or comment as to the examiner’s reasons for allowance, and permitted the claims to issue. Ex parte Yamaguchi, 61 USPQ2d 1043 (Bd. Pat. App. & Inter. 2001)(precedential) held that a surrender of claimed subject matter cannot be based solely upon an applicant’s failure to respond to, or failure to challenge, an examiner’s statement made during the prosecution of an application. Applicant is bound only by applicant’s revision of the application claims (including examiner's amendments authorized by applicant) or a positive argument/statement by applicant. An applicant’s failure to present on the record a counter statement or comment as to an examiner’s reasons for allowance does not give rise to any implication that applicant agreed with or acquiesced in the examiner’s reasoning for allowance. Thus, the failure to present a counter statement or comment as to the examiner’s statement of reasons for allowance does not give rise to any finding of surrender. The examiner’s statement of reasons for allowance in the original application cannot, by itself, provide the basis for establishing surrender and recapture. Scenario 1- Limitation C is Surrendered Subject Matter: The examiner’s statement of reasons for allowance in the original application stated that it was limitation C (of the combination of ABC) which distinguished over a potential combining of references X and Y, in that limitation C provided increased speed to the process. Applicant filed comments on the examiner’s statement of reasons for allowance essentially supporting the examiner’s reasons. Limitation C is thus established as relating to subject matter previously surrendered. Scenario 2- Limitation C is Not Surrendered Subject Matter: On the other hand, if applicant’s comments on the examiner’s statement of reasons for allowance contain a counter statement that it is limitation B (of the combination of ABC), rather than C, which distinguishes the claims over the art, then limitation B would constitute a surrender generating limitation, and limitation C is not surrender generating limitation. Scenario 3- There is No Surrender: If applicant replies to the examiner’s statement of reasons for allowance with a general statement that the claims are allowable because the prior art of record does not anticipate or render obvious the claims as a whole, then there will be no surrender. C. The Third Step - Are the Reissue Claims Materially Narrowed in Other Respects, and Hence Avoid the Recapture Rule? As pointed out above, this third step of the recapture determination, as set forth in North American Container, considers the significance of the claim limitations that were added and deleted, during prosecution of the patent (to be reissued) to determine whether the reissue claims should be barred under the recapture doctrine. In the decision of In re Mostafazadeh, 643 F.3d 1353, 98 USPQ2d 1639 (Fed. Cir. 2011), the Federal Circuit stated that to avoid the recapture rule "the claims must be materially narrowed relative to the surrendered subject matter such that the surrendered subject matter is not entirely or substantially recaptured." Id. at 1361, 98 USPQ2d at 1644. Under this third step, it must be determined if there is entire or substantial recapture of the surrendered subject matter because there is no or insufficient material narrowing to avoid the recapture rule. The following discussion addresses analyzing the reissue claims that have eliminated or modified a surrender generating limitation, as determined under step 2 analysis. In any broadening reissue application, the examiner will determine, under steps 1 and 2 of the recapture analysis on a claim-by-claim basis, whether the broadening relates to subject matter that was surrendered during the examination of the patent for which reissue is requested. Under step 3, it must be determined if such reissue claims are materially narrowed so as to escape the effects of the recapture doctrine. Note, examiners should consider any relevant preliminary applicant arguments of record as part of the recapture determination. See subsection VII., below, "REBUTTAL BY THE REISSUE APPLICANT," which points out how the recapture finding of the Office can be rebutted by applicant, in some limited instances, by showing that material narrowing is present in the claims. The modification of a surrender generating limitation is broken down into two possibilities that will be addressed below. 1) If a surrender generating limitation (SGL) has been entirely eliminated from a claim present in the reissue application, then a recapture rejection under 35 U.S.C. 251 may be proper. For example, if a claim limitation present in the original patent that was added to overcome a rejection or that was argued by applicant to distinguish over the prior art is entirely eliminated from a claim in the reissue application and not replaced by a new SGL-related limitation, then a recapture rejection under 35 U.S.C. 251 is proper and must be made for that claim. Such an omission in a reissue claim, even if it is accompanied by other limitations making the reissue claim narrower than the patent claim in other unrelated aspects, is impermissible recapture. Pannu, 258 F.3d at 1371-72, 59 USPQ2d at 1600. But note that even if the SGL limitation in the patent claims was entirely eliminated, the reissue applicant may have added a new limitation that relates to surrendered subject matter. See the last paragraph of this subsection below. It must be determined what portion of the amendment or argued limitation has been retained, and whether the retained portion materially narrows the original claims to avoid recapture. See Youman, 679 F.3d at 1346 n.4, 102 USPQ2d at 1870 n.4 ("'original claims' are defined as 'the claims before surrender'"). "[I]f the patentee modifies the added [or argued] limitation such that it is broader than the patented claim yet still materially narrows relative to the original claim, the recapture rule does not bar reissue." Id. at 1347, 102 USPQ2d at 1870. On the other hand, if the retained portion of the modified limitation is "well known in the prior art," impermissible recapture has not been avoided. See Mostafazadeh, 643 F.3d at 1361, 98 USPQ2d at 1644. It is to be noted that if the retained portion of the modified limitation is well known in the prior art, then impermissible recapture exists, even in a case where a further limitation which is not related to the surrendered subject matter (i.e., a limitation that does not materially narrow the claims) has been added to define the claims over the art. Id. In both situations 1 and 2, even "[i]f the modified limitation does not materially narrow (or, in other cases, the limitation is eliminated)," it may be that "the reissued claims were materially narrowed in other respects so that the claims have not been enlarged, and hence avoid the recapture rule." Youman, 679 F.3d at 1347, 102 USPQ2d at 1870. In other words, even if the modified limitation does not materially narrow, the reissue applicant may have added a new limitation that still relates to surrendered subject matter (e.g., same characteristic or concept). The material narrowing must relate to what was amended or argued by applicant in the original application, to define the claim over the art. Greenliant Systems, Inc. et al v. Xicor LLC, 692 F.3d 1261, 1271, 103 USPQ2d 1951, 1958 (Fed. Cir. 2012). If the reissue applicant believes that "the reissued claims were materially narrowed in other respects," the reissue applicant should point out explicitly what limitation has been added to the claims to materially narrow and how it materially narrows the claims. The following examples are provided for analyzing the reissue claims for recapture. The recapture rule bars the patentee from acquiring, through reissue, claims that are in all aspects (A) of the same scope as, or (B) broader in scope than, those claims canceled from the original application to obtain a patent. Ball Corp. v. United States, 729 F.2d at 1436, 221 USPQ at 295. The discussion below is directed to the situation where the reissue claims are narrower than the canceled claims in some aspect, but are broader than the patent claims in some other aspect. Note, as discussed above in subsection II.A, if the reissue claims are equal in scope to, or narrower than, the patent claims (as opposed to the canceled claims) in all aspects, then there can never be recapture and the discussion that follows is not applicable. If the reissue claims are narrower in scope than the claims canceled from the original application by inclusion of the entirety of the limitation added to define the original application claims over the art, there will be no recapture, even if the reissue claims are broader than the canceled claims in some other aspect (i.e., an aspect not related to the surrender made in the original application). For example, assume combination AB was originally claimed in the application, and the claim was amended in response to an art rejection to add element C, and thus, provide ABC (after which the patent issued). The prosecution history of the original application does not include any patentability arguments based on limitation B alone or in combination with A, C, or A and C. The reissue claims are then directed to combination ABbroadenedC. The ABbroadenedC claims are narrower in scope when compared with the canceled claim subject matter AB with respect to the addition of C (which was added in the application to overcome the art). Because the reissue claim retains surrender-generating limitation C and the broadening was not in the area of the surrendered subject matter, there is no recapture. On the other hand, if the amendment paper that added element C in the prosecution of the original application included arguments that the combination of B and C defined the claimed invention over the prior art (e.g., there is synergistic effect of B and C), then there will be recapture unless the claim is materially narrowed in a manner related to the surrendered subject matter. See example (4) in subsection B below. As another example, assume combination ABZ was originally claimed in the application, and the claim was amended in response to an art rejection to add element C and thus provide ABZC (after which the patent issued). The prosecution history of the original application does not include any patentability arguments based on limitation Z. The reissue claims are then directed to combination ABC (i.e., element Z is deleted from the canceled claims, while element C remains present). The ABC claims of the reissue are narrower in scope as compared to the canceled claim subject matter ABZ with respect to the addition of C (which was added in the application to overcome the art). Because the reissue claims retain surrender-generating limitation C, there is no recapture. As pointed out above, where the reissue claims are narrower than the patent claims in all aspects, then there can never be recapture. If reissue claims are equal in scope to the patent claims, there is no recapture as to those reissue claims. Where, however, reissue claims are both broadened and narrowed as compared with the patent claims, the nature of the broadening and narrowing must be examined to determine whether the reissue claims are barred as being recapture of surrendered subject matter. If the claims are "broader than they are narrower in a manner directly pertinent to the subject matter... surrendered during prosecution" (Clement, 131 F.3d at 1471, 45 USPQ2d at 1166), then recapture will bar the claims. This narrowing/broadening vis-à-vis the patent is broken down into four possibilities that will now be addressed. If a claim is presented in a reissue application that omits, in its entirety, the surrender-generating limitation, that claim impermissibly recaptures what was previously surrendered, and that claim is barred under 35 U.S.C. 251. Note, however, subsection VII., below, "REBUTTAL BY THE REISSUE APPLICANT," which points out how the recapture finding of the Office can be rebutted by applicant, in some limited instances, by showing that material narrowing is present in the claims. In this case, there is recapture. Recapture exists because there is no addition of a new limitation that is related to the surrendered subject matter or if there is a new limitation that is related to the surrendered subject matter but it fails to materially narrow the claim (e.g., only adds what is known in the prior art). This situation is where the patent claims are directed to combination ABC and the reissue claims are directed to ABD (which is not an overlooked aspect). Element C was either a limitation added to AB to obtain allowance of the original patent, or was argued by applicant to define over the art (or both) in the prosecution of the original application. Thus, addition of C (and/or argument as to C) has resulted in the surrender of any combination of A & B that does not include subject matter related to C. Element C is a surrender generating limitation. Element D, on the other hand, is not related to the surrendered subject matter. Thus, the reissue claim, which completely eliminates C, is broadened in an area related to the surrender. The narrowing of the claim by the addition of D will not save the claim from recapture because D is not related to the surrendered subject matter. If, however, element D were related to the surrendered subject matter and materially narrowed the claim compared to the canceled claim, recapture may be avoided. See example 4 below. Reissue claims that are broader than the original patent claims by entirely omitting the surrender-generating limitation (element C, in the example given) without a related replacement limitation will be barred by the recapture rule even though there is narrowing of the claims by adding limitation(s) not related to the surrendered subject matter. As stated in the decision of In re Clement, 131 F.3d at 1470, 45 USPQ2d at 1165, if the reissue claim is broader in an aspect germane to a prior art rejection, but narrower in another aspect completely unrelated to the rejection (e.g., fails to materially narrow the claim relative to the surrendered subject matter), the recapture rule bars the claim. Pannu, 258 F.3d 1366, 59 USPQ2d 1597, provides a fact situation in which this scenario was held to be recapture. In this case, there is no recapture. This situation is where the patent claims are directed to combination ABCDE and the reissue claims are directed to ABDE (element C is omitted). Assume that the combination of ABCD was present in the original application as it was filed, and element E was later added to define over that art. No argument was ever presented as to elements A-C defining over the art. Additionally, the reissue claims are certainly permitted to recite combination ABDEspecific (where surrender-generating element E is narrowed). The patent claims can be broadened in an area not directed to the surrender (by omitting element C) and narrowed in the area of surrender (by narrowing element E to Especific) without violating the recapture doctrine. As another example, assume limitation C was added to application claims AB to obtain the patent to ABC, and now the reissue application presents claims to AC or ABbroadC. Such reissue claims avoid the effect of the recapture rule because they are broader in a way that does not attempt to reclaim what was surrendered earlier. Mentor Corp. v. Coloplast, Inc., 998 F.2d 992, 994, 27 USPQ2d 1521, 1525 (Fed. Cir. 1993). Such claims are considered to be broader in an aspect not "germane to a prior art rejection," and thus are not barred by recapture. Note In re Clement, 131 F.3d at 1470, 45 USPQ2d at 1165. Reissue claims that are broader than the original patent claims by deletion of a limitation or claim requirement other than the "surrender-generating limitation" will avoid the effect of recapture, regardless of the nature of the narrowing in the claims, and even if the claims are not narrowed at all from the scope of the patent claims. In this instance, there is clearly no recapture. In the reissue application, there has been no change in the claims related to the matter surrendered in the original application for the patent. In this case, there may be recapture. Assume the combination AB was originally claimed in the application, and was amended in reply to an art rejection to add element C and thus provide the combination ABC (after which the patent issued). A reissue application is then filed, and the reissue application claims are directed to the combination ABCbroadened. The ABCbroadened claims are narrowed in scope when compared with the canceled claim subject matter AB (e.g., the original claims), because of the addition of Cbroadened. Thus, the claims retain, in broadened form, the limitation argued/added to overcome an art rejection in the original prosecution. In this instance, a recapture rejection can be made even though ABCbroadened is narrower than canceled claim subject matter AB, if Cbroadened was "well known in the prior art" or otherwise fails to materially narrow the application claims to avoid recapture of the surrendered subject matter. In Mostafazadeh, the panel explained that "if reissue claims ‘materially narrow[ed]’ the claims relative to the original claims," there is no impermissible recapture, where "full or substantial recapture of the subject matter surrendered during prosecution is avoided." See In re Mostafazadeh, 643 F.3d 1353, 1358, 98 USPQ2d 1639, 1642 (Fed. Cir. 2011) (emphasis added). In other words, "if the patentee modifies the added limitation such that it is broader than the patented claim yet still materially narrows relative to the original claim, the recapture rule does not bar reissue." In re Youman et al., 679 F.3d 1335, 1347, 102 USPQ2d 1862, 1870 (Fed. Cir. 2012). Any recapture of surrendered subject matter that was contained in prior art of the original prosecution forms the ceiling for determining whether the modified limitation is materially narrowing. Id. For patents issued on an application subject to the pre-AIA prior art regime (pre-AIA patents), a patentee may file a reissue application to permit consideration of process claims which qualify for pre-AIA 35 U.S.C. 103(b) treatment if a patent is granted on an application entitled to the benefit of pre-AIA 35 U.S.C. 103(b), without an election having been made as a result of error without deceptive intent. See MPEP § 706.02(n). This is not to be considered a recapture. The addition of process claims, however, will generally be considered to be a broadening of the invention (Ex parte Wikdahl, 10 USPQ2d 1546 (Bd. Pat. App. & Inter. 1989)), and such addition must be applied for within two years of the grant of the original patent, or in an appropriate continuing broadening reissue application claiming the benefit of a prior-filed broadening reissue application filed within two years of the grant of the original patent. See also MPEP § 1412.03 as to broadened claims. A patentee may file a reissue application to permit consideration of article of manufacture claims (not presented in the patent to be reissued) which are functional descriptive material stored on a computer-readable medium, where these article claims correspond to the process or machine claims which have been patented. The addition of these "article" claims will generally be considered to be a broadening of the invention (Ex parte Wikdahl, 10 USPQ2d 1546 (Bd. Pat. App. & Inter. 1989)), and such addition must be applied for within two years of the grant of the original patent. See also MPEP § 1412.03 as to broadened claims. Reissue claims which recapture surrendered subject matter should be rejected using form paragraph 14.17. Claim rejected under 35 U.S.C. 251 as being an impermissible recapture of broadened claimed subject matter surrendered in the application for the patent upon which the present reissue is based. See Greenliant Systems, Inc. et al v. Xicor LLC, 692 F.3d 1261, 103 USPQ2d 1951 (Fed. Cir. 2012); In re Shahram Mostafazadeh and Joseph O. Smith, 643 F.3d 1353, 98 USPQ2d 1639 (Fed. Cir. 2011); North American Container, Inc. v. Plastipak Packaging, Inc., 415 F.3d 1335, 75 USPQ2d 1545 (Fed. Cir. 2005); Pannu v. Storz Instruments Inc., 258 F.3d 1366, 59 USPQ2d 1597 (Fed. Cir. 2001); Hester Industries, Inc. v. Stein, Inc., 142 F.3d 1472, 46 USPQ2d 1641 (Fed. Cir. 1998); In re Clement, 131 F.3d 1464, 45 USPQ2d 1161 (Fed. Cir. 1997); Ball Corp. v. United States, 729 F.2d 1429, 1436, 221 USPQ 289, 295 (Fed. Cir. 1984). The reissue application contains claim(s) that are broader than the issued patent claims. The record of the application for the patent shows that the broadening aspect (in the reissue) relates to claimed subject matter that applicant previously surrendered during the prosecution of the application. Accordingly, the narrow scope of the claims in the patent was not an error within the meaning of 35 U.S.C. 251, and the broader scope of claim subject matter surrendered in the application for the patent cannot be recaptured by the filing of the present reissue application. In bracket 2, the examiner should explain the specifics of why recapture exists, including an identification of the omitted/broadened claim limitations in the reissue which provide the "broadening aspect" to the claim(s), where in the original application the narrowed claim scope was presented/argued to obviate a rejection/objection, and that the reissue claim is not materially narrowed to avoid recapture (i.e., explain the prima facie analysis done for steps 1-3). See MPEP § 1412.02. The reissue applicant may rebut a recapture rejection by demonstrating that a claim rejected for recapture includes one or more claim limitations that "materially narrow" the reissue claims in a way that relates to the subject matter surrendered during original prosecution. Assume that the original application claim ABCD was amended during prosecution and results in a patent claim ABCDE. 1. ABCD → Eliminates E, the surrender generating limitation (SGL). 2. ABCDF → Eliminates E, the SGL; adds narrowing limitation F, which was determined to be not materially narrowing under step 3. 3. ABCDE broader → Broadens E, the SGL; Ebroader is well known in the art. 4. ABCDE broader F → Broadens E; Ebroader is well known in the art; adds narrowing limitation F, which was determined to be not materially narrowing under step 3. In these four examples, a recapture rejection would be made. For examples 2 and 4, applicant may try to rebut the recapture rejections by showing that limitation F "materially narrows" the reissue claims in a way that relates to the subject matter surrendered during original prosecution. If such is the case, the reissue applicant should point out explicitly what limitation has been added to the claims (in this case, limitation F) and how it materially narrows the claims. 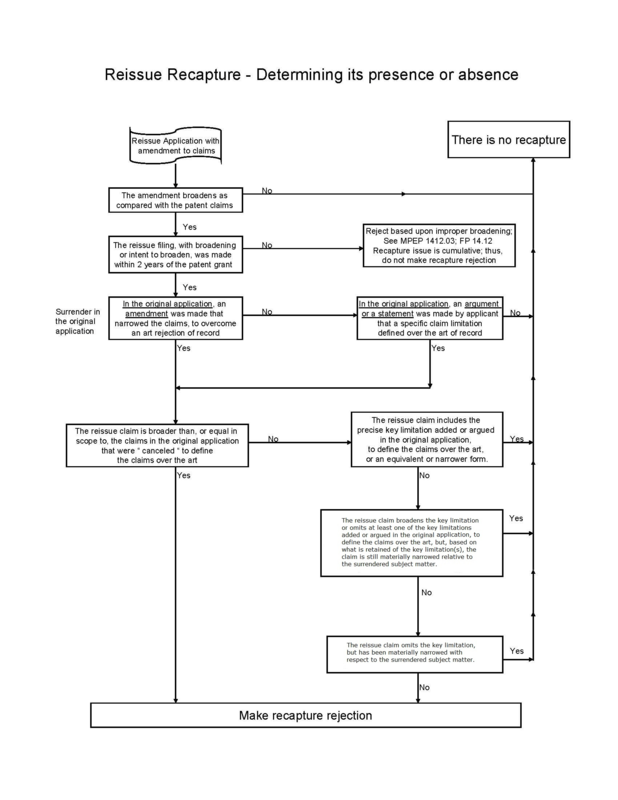 See the recapture-analysis flow chart which follows for assistance in determining whether recapture is present, consistent with the case law discussed above.